We first heard about the Sony Xperia MT27i Pepper smartphone back in January and now a press shot of the device has been leaked along with some of the handsets specifications. 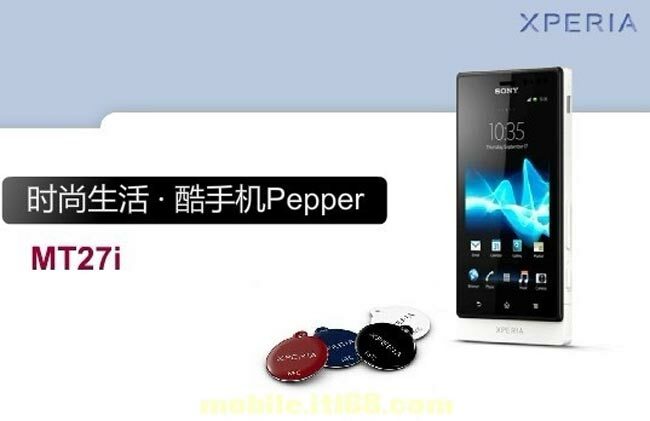 The Sony Xperia Pepper is expected to be the successor to the Xperia Neo, and the device will come with a 3.7 inch FWVGA touchscreen display with a resolution of 480 x 854 pixels. Other specifications on the Sony Xperia Pepper include a dual core 1GHz processor and a five megapixel camera, and the device will also come with NFC and use Sony’s new Smart Tag’s. We dont as yet have any more information on the Sony Xperia Pepper, as soon as we get some more details we will let you guys know.